In Part 1 of this series, Scholarship America program designer Cheryl Amundson (a former professor, and mom of three college grads) walked you through two things any scholarship seeker needs to do: get organized before you have to, and start a wide search as early as you can. 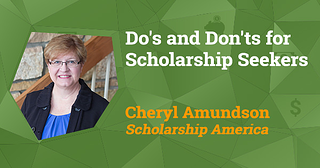 Today, Cheryl returns to offer expert advice on what to do next—as well as the top ten things to avoid while scholarship searching. 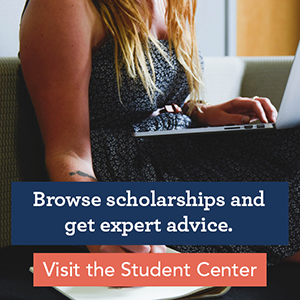 So, you’ve got your resume together and you’ve conducted your first search online: scholarships for four-year college students in your graduating class. And you got 35,000 results. Unless you’re very good at time management, you’re not going to apply for 35,000 scholarships. Instead, you need to refine your search to find the scholarship opportunities that match best with your self-inventory. At Scholarship America, we work with small businesses, large corporations, foundations, trade associations, nonprofits and many other kinds of sponsors, on more than 1,300 individual scholarships. And almost all of those sponsors have unique objectives, eligibility requirements, selection criteria and award distribution for scholarship programs. Just like those scholarship sponsors, you need to be selective, and consider the return on your investment. To do so, look at your self-inventory, and then refine your search to narrowly focus on the strongest parts of your resume: have you done a ton of volunteering? Search and apply for scholarships that center on community service. Are you a straight-A student? Focus on academic-achievement scholarships. Use your favorite activities as keywords in your search, and you can go a long way toward narrowing down that initial daunting list. Another important distinction to keep in mind is the difference between “need-based” and “merit-based” scholarships. Merit-based awards are given based on individual achievement, and do not consider a student’s financial situation. Need-based awards, on the other hand, are given specifically to students who demonstrate financial need. If you know your family’s savings, a government grant or an award from your school will be covering most of your costs, you can save yourself time by not applying for these scholarships. Even after you’ve narrowed down your search, you’ll probably still have dozens or even hundreds of scholarships you’re interested in. To keep up with them all, and to budget your time, consider creating a spreadsheet or using a calendar app to track scholarships of interest. When it comes time to apply, take another, closer look at each scholarship’s eligibility requirements and award guidelines. It’s easy to miss bullet points when you’re searching, and the last thing you want to do is waste your time applying for a scholarship that’s only open to students in another state or with a different major. Once you’ve ensured you’re eligible, take a deep breath, slow down and focus on the application at hand. Make sure you read questions carefully and answer honestly and fully. It’s okay to reuse essays on multiple applications, but make sure you customize the language to address the specific goals of each scholarship. After you’ve written everything you can for each question, you’ll be tempted to hit “submit” and send your application along. Don’t. Instead, save your information, walk away and come back to it a day later. This will give you a chance to reflect on your answers, add anything you forgot and proofread your writing with a clearer view. After all, you only have one chance to apply—make it the best you can. The strategies outlined above will help focus your scholarship searching and ensure you’re getting the best return on your time investment when applying. To stay on track, here are the top ten things you should avoid during the process. Don’t wait until the last minute. Planning ahead is the single most important part of the process, and it makes everything else go more smoothly. Don’t let others do your work. Your scholarship application needs to be an authentic portrait of you. Don’t fall for scams. If something sounds too good to be true, it probably is. Here are five signs that a scholarship may be a scam. Don’t spend money to make money. A legitimate scholarship program will never charge you a fee to apply. If an application asks for money, walk away. Don’t give out bank or credit card information. Any financial data you provide should come from IRS or FAFSA data. Legitimate providers do not ask for bank information. Don’t believe you are guaranteed a scholarship. Even if you think you’re a shoo-in for a scholarship, take the time to fill out and submit your application properly and fully. Don’t avoid a scholarship just because you have to write an essay. Scholarship essays can be stressful, especially if you think you’re not a great writer. But don’t be scared — scholarship providers want to know your story, and this is your chance to tell it. Don’t reuse essays without updating. If you write one great essay, it’s tempting to use it over and over. This is okay — just make sure you update it for each application. Don’t get discouraged. As we said in Part 1, there are $50 billion in scholarships given out each year. No matter what makes you stand out, there’s an award for you!